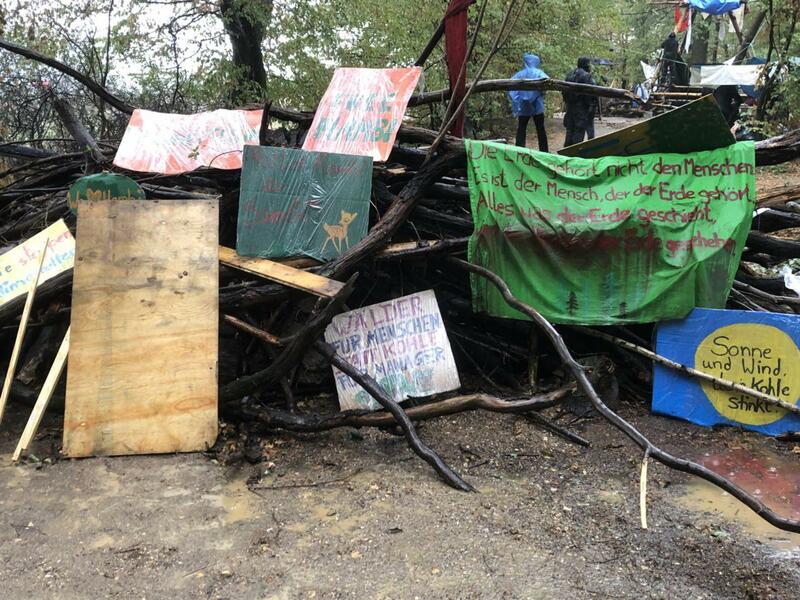 Hambacher Forest, September 23: On Saturday the cops banned the weekly Sunday forest walk and announced that they only allowed a stationary gathering. Thousands went into the forest in an act of mass cicil disobedience. The cops lost control for hours. When we ( a team of 2 persons today, I was one of them) arrived the cops had installed a checkpoint at the opposite of the permanent vigil (video in Tweet below). More and more people arrived and it was pretty clear to us the cops would not be able to check all people. The road was to small and the open fields at both sides of the road were to dificult to control. On Saturday cops damaged one of our camaera’s at a checkpoint, so we were even less enthousiatic about checkpoints as we normally are. But often it’s not that difficult to pass on alternative routes without being checked. The stationary gathering was scheduled to start at 11:30, but more and more people crossed the fields to avoid being checked and to get into the forest (Image below. Image by @infozentrale). We were among the first ones that arrived in Hambacher forest and at that moment the army of 4000 cops were still controlling the forest. They checked us 2 times in the forest but didn’t stop us. We left Beechtown and went to Cosytown. Some of the tree houses were evicted in the past weeks, but not all. Soon people started to build barricades to protect one of the two tree houses that was not evicted until now. More and more people came and more and more barricades were build. A few police vans arrived, but retreated again after a few minutes. To much determined people. Many many people were building barricades everywhere around us. After the cops retreated, more and more barricades were build on the road between Beechtown and Cosytown. NRW state minister of interior, Herbert Reul, told German media several times that the eviction stop is temporarily, exploiting Steffen’s death by saying that he is even more convinced that the tree houses have to be evicted “because they are to dangerous”. Last night RWE’s (Reul) puppet even told WDR media that the eviction has nothing to do with uprooting Hamacher forest. We decided to go to Lorien. During our walk to Lorien we saw small groups of riot cops standing around. It looked pretty planless what the cops were doing. Around the small treehouse village people were digging trenches and improving barricades. We walked through the forest again, saw new tree houses and barricades on two sides of police vans. That explained why the cops acted planless for hours: Manyx of them were trapped between barricades. As am armored vehicle came into the forest, people climbed on the armored vehicle and were dancing on it. The armored vehicle retreated again. We passed the cops that were trapped between the barricades, a female cop complained to her colleagues: “They can’t let us stand in the rain for hours and hours, we will al get sick.” When we passed the last barricade we noticed that even the police vans that were not trapped had problems with the rain. The forest road had turned into mud and we saw 4 cops that had to push their van. At T-Town the cops started to remove barricades (Video in Tweet below). But they stopped and headed to Beechtown/Cosytown, where the cops had lost control for hours. The cops were desperate and even started to confiscate canvas to protect people from the rain. The pouring rain didn’t stop and in the afternoon the wind was getting stronger. Hard conditions for everybody. We went back to the road between Beechtown and Cosytown. Soon the cops started to reinforce and attacked people with pepper spray. The cops also came to the memorial for Steffen at Beechtown. In full riot gear. No respect. More and more cops arrived, they had to walk though the forest, because their vans were still trapped between barricades. After we left the area two groups were kettled at Cosytown and cops started to remove barricades. We walked through the forest and saw new barricades everywhere. People didn’t only defy the ban against the forest walk, there was spontaneous mass civil disobedience in Hambacher forest. We saw people building barricades, who probably did nothing like that before in their life. We saw cops loosing control for hours that didn’t know how to respond for a long time. The fight against uprooting the Hambacher forest is far from over. The determination of so many people was impressive and when Reul gives a green light to continue with the evictions, he will only make people even more angry. Reportback: Thousands building barricades on a sunny afternoon – Enough is Enough!